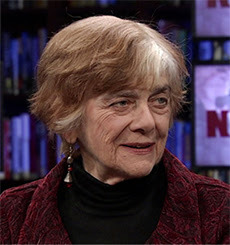 Frances Fox Piven, pictured above, is generally recognized as a provocative commentator on America’s social welfare system. Together with her long-time collaborator and husband, Richard Cloward, she wrote an article in the May 1966 issue of The Nation titled, "The Weight of the Poor: A Strategy to End Poverty." That article argued for a political strategy that was eventually called the "Cloward-Piven strategy." The strategy she urged was to work for an increased enrollment in social welfare programs, so that increased demand would ultimately collapse the social welfare system and force reforms, specifically including a guaranteed annual income for all members of society. Dr. Piven's 1971 book, Regulating the Poor: the Functions of Public Welfare, is considered to be a classic, and is still in print. In view of Dr. Piven's focus on social welfare issues, some might find it surprising that she appears in the August 2015 issue of In These Times as a commentator on global warming and the climate change movement. But so she does. "In Turning Up the Heat on Washington," Dr. Piven points out that we are ever less able to deal with the collective crises that confront us, and that this inability to act collectively has come about because we have given up on government. My posting in this blog on July 17th commented on a book review that highlighted this point, noting the agreement of both right-wing and left-wing commentators that our government is dysfunctional, and that some sort of genuine "revolution" is necessary. Neither the progressives nor the conservatives think much of government. There is a confusion in the Left's disillusion with the state. For a long time, social democrats relied on the state as a powerful agency that could temper market forces and bring some equality to society. But now people are tremendously disappointed not with state power as such, but with the power groups that are behind the state....We have to democratize the state....The problem is not government. The problem is the corruption of government. American public opinion is not what is driving our policies to the right. It's organized interests and economic elites. We need government, but we need democratic government. That's the problem - not just for the climate change movement, but for all of us.